While these youngsters all have Down's syndrome, they are overcoming stereotypes and the ignorance of others by living life to the full. Today, as we mark Down's Syndrome Day, Lisa Smyth hears how they are achieving their dreams and are a source of joy to families and friends. In just a matter of weeks James Martin will make his television debut in the lead role of a new BBC NI drama. It's an incredible achievement for anyone wanting to make it in the fickle world of acting, but it's even more impressive in light of the predictions made by doctors when he was born. Within minutes of welcoming his first child into the world, Ivan Martin suspected his son had Down's syndrome. However, even when this was confirmed by a doctor, Ivan (67) was unfazed. The diagnosis was irrelevant as far as he was concerned and he has raised James in exactly the same way as his second child, 24-year-old Daniel. He explains: "I looked at him in his little cot in the delivery suite and I thought: 'This child looks to me like he has Down's syndrome'. "Then I thought to myself that I'd never seen a newborn baby before and maybe they all looked like that. "I asked the nurse if she thought he had Down's syndrome and she pretended she hadn't heard me, so I asked her again and again she tried to look busy. "But eventually she told me the doctor would be along soon to talk to us. "To be honest, it didn't make any difference to me or my wife and we quickly realised that, whether he had Down's syndrome or not, he was a baby with all the needs that babies have. "He needed to be bathed, he needed to be changed and fed, and we very quickly settled down into looking after our new baby. "Twenty-seven years later we have a healthy young man who does everything - and more - that other 27-year-olds do. "When I look at James it never occurs to me that he has Down's syndrome, I see him as my son James and that's just the way it is." Like so many parents of children with Down's syndrome, Ivan and his wife Suzanne (51) were told by health professionals to limit their expectations. But the couple, who live in south Belfast, refused to accept that James would do anything but shine. James is outgoing and confident, he has two jobs - one in Starbucks and the other working in Scalini restaurant in south Belfast. He also has a packed schedule outside of work, including playing tag rugby, swimming on a Tuesday, boxing training on a Wednesday and marshalling at the Park Run at Queen's University on a Saturday. "He has a better social life than me," says Ivan. However, James' greatest passion is acting and he has finally been given the opportunity to show off his natural talent after winning the lead part in the forthcoming BBC drama, Ups And Downs. James caught the eye of the film's writer and director Eoin Cleland, and he managed to beat off competition from other aspiring actors from all over Northern Ireland. Ivan continues: "I heard all the negative things from doctors for the first couple of years after James was born. "I never accepted any of them, we raised him just the same as Daniel and they have both grown up to be very successful. "I remember when James was very young, maybe 18 months or two years, and he wasn't speaking, a doctor with the bedside manner of Attila the Hun told me that I just had to accept it was most likely he'd never speak. He told me I just had to get my head round it and get on with it, but then James started talking and he hasn't stopped since. "He's been proving the medical professionals wrong his entire life." And Ivan is confident that James will blow away viewers when Ups And Downs airs. "I think it will make people laugh and cry in equal measure," he says. "Acting is as natural to James as eating or breathing and we're very excited to see him on TV. "Suzanne and I have never stopped James from doing anything he wanted to do. "When I first saw the script for Ups And Downs and saw it was 58 pages, I wondered how on Earth he was going to learn his lines. "I knew I would struggle with it but then I just had to trust that he would work it out and apparently learning his lines has never been a problem for James." Looking to the future, Ivan firmly believes James can live independently. He said: "I'm so proud of him and I'm delighted at what he has achieved so far. "Aside from anything else, James is a great friend and we do a lot together. "I suppose if I had to say anything to someone who has just found out their child has Down's syndrome, it would be that it's all good, you know." Margaret Watson lights up when she talks about her youngest daughter. It's obvious that eight-year-old Luciah is an integral part of the family and a source of endless joy to the 42-year-old mum. Of course, in the moments after she found out her daughter had Down's syndrome, Margaret was unsure what the future held for her precious newborn. But she quickly brushed aside any concerns and, looking to the future, has the same ambitions for Luciah as she does her two older daughters. "I can see her being a teacher or an actress, just from the way she gets on," says Margaret. "She goes to Girls' Brigade but because of her learning disability they have her with the younger ones and she's always trying to keep them right and show them how things should be done. "It might not be when she is 17 or 18, it might be a bit further down the line, but in the end, I can see her doing it." Luciah's arrival into the world was dramatic to say the least. Margaret, who lives in Dunmurry with Luciah and her sisters, Morgan (15) and Chloe (17), was 38 weeks pregnant and attending her final antenatal appointment when the midwife became concerned. "She asked me if I was sure I was as far along in the pregnancy as I was saying I was because the baby was measuring small," continues Margaret. "She had actually stopped growing at 30 weeks. "There was no bed at Lagan Valley, so I was sent to Altnagelvin with the blue lights going the whole way. It only took 50 minutes. "When I got there the doctor came to see me and warned me he didn't think the baby would make it because she was so small. "They were preparing me that the baby might not be crying when was born, that she could be floppy and to basically prepare for the worst." Luciah was born by Caesarean section the following day, weighing a delicate 3lbs 12oz. But to Margaret's delight, her colour was good and she was kicking and screaming. "The doctor brought her to me and put her in my arms and I remember thinking how tiny she was," she says. "He asked me if I noticed anything different about her, but all I could see was how tiny she was. "The doctor started stroking her face and asked me about her wee features, I just thought she looked like my middle girl. "Before she was born they were telling me she might not survive, yet here she was healthy and in my arms, so it didn't matter that she had Down's syndrome." In the days that followed, however, Margaret was repeatedly told of all the things that Luciah would never be able to do. People even commiserated with her when they found out her daughter had Down's. But this just made Margaret determined to ensure that Luciah would flourish as she grows. "Once you get over the shock of it there was a bit of grief, but it didn't last long," she says. "Luciah was born on September 29 and discharged on December 17. Her two sisters actually changed their letters to Santa that year asking for her to be allowed home in time for Christmas. "I wasn't given much information when she was discharged, just leaflets mainly, but everything I was being told was very, very down. "As far as I was concerned, she was a normal child and I was going to treat her exactly the same way as my other two children. "She goes to Parkview Special School in Lisburn and she loves it. Her teacher tells me she could take the day off and Luciah could teach her class. "She loves chatting with people, everywhere she goes she says hello to everyone she meets. "So many people think having Down's syndrome is a negative thing, but I've always concentrated on what Luciah can do. I don't think there's any reason she can't achieve what she wants, I think it just depends on how you bring up your child. "Luciah is so clever, she copies things and remembers them months later, she makes everyone she meets so happy, she asks them if they're happy and that makes her happy. "Everyone who meets her thinks she's adorable - she just brightens up your day. "I heard recently that someone I know who is pregnant has found out their baby has Down's syndrome. My initial reaction was that I wanted to contact her and let her know that everything is going to be okay. Luciah is amazing and I wouldn't change her for the world." Just a few years ago Kate Grant was an ordinary teenager with a big dream. Living with Down's syndrome in Cookstown, it seemed unlikely that she would ever fulfil her ambition to become a model. Certainly, most people scoffed at the idea, but her mum Deirdre knew in her heart that Kate had the passion and character to make it. With a simple appeal on social media asking for Kate to be given an opportunity, she set the wheels in motion for Kate to become an inspiration to people with learning disabilities all over the world. Such is her reach and success to date, Kate is due to address the UN today at the World Down's Syndrome Day conference in Geneva where she will impress upon delegates the employability of people with Down's syndrome. It's an incredible achievement for any 20-year-old, but it's even more significant in light of the grim predictions made by doctors after she was born. Deirdre, a yoga teacher, says: "They said she would never speak and she might not be able to walk, they said she might constantly be in nappies. "They said she might have seizures, that she would have epilepsy. "I do remember one young paediatrician saying to me before I left the hospital to stimulate that child, and that's exactly what I've done. "No matter where we went or what we did, I have always described everything around us, the colours, the textures, the sounds, and I think that has really helped. "It's no wonder she's a chatterbox, really." Kate hit the headlines at the start of the year when it was announced that she had been selected as a brand ambassador for cosmetic giant Benefit. She has since taken part in a photoshoot for high street retailer River Island and has only just returned from the Special Olympics World Games in Abu Dhabi, where she handed out medals. But it hasn't all been plain sailing for Kate - just one person turned up to her 16th birthday party and she has faced an uphill struggle to prove her worth. Deirdre, however, has always been her biggest champion and she was determined to give Kate the tools to succeed. She explains: "I challenge her all the time. "I have always taught her not to give in, I think there are a lot of people who might give in if their child had Down's syndrome, but I was never like that. "You know if I wanted her to use a spoon, I had to teach her that she could. "She never would have done it otherwise, so I put her bowl of food down and a spoon down in front of her and she knew if she wanted to eat she had to do it herself. "You should have heard the screams of her, it was heartbreaking and I had to leave the room, it really was tough love. "She could do it, it was just a matter of convincing her that she could do it." Deirdre is overjoyed that Kate is now seen as a role model for people with learning disabilities. 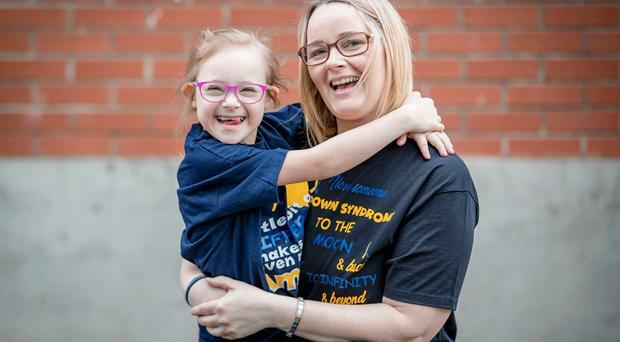 "It's incredible to think that my daughter is making such a difference and inspiring other people, and not just people with Down's syndrome, to realise that they can achieve their dream," she says. "Kate is proof that if you are determined and you work hard then you can succeed. "People with Down's syndrome are no different to anyone else, they're still a person and you should talk to them the same way you would talk to anyone else. "The beautiful innocence of them, I think we as a society can learn so much from them. "They have such a simplistic way of looking at the world, there's no grey, everything is black and white. "Kate takes everything at face value, nothing fazes her, she takes everything in her stride. "Even going to address the UN, she just gets on with it, and I think that's a wonderful quality. "There is something special about people with Down's syndrome and I would like business people to look at them and see the potential they have. "They have so much to give and if you ask them to do a job, it will be done exactly the way you have trained them to do it. "Kate has been given all these wonderful opportunities and she has shown how professional she can be. "She has worked so hard and she is so determined. "She still wants to model in Paris, London, New York and Milan and I really don't see why it can't happen. "I still think there is so much more to Kate that people haven't seen yet - just watch this space."